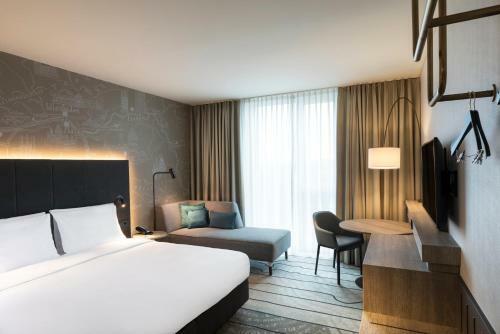 Located just within a 4-minute drive from Frankfurt's International Airport, Hyatt Place Frankfurt Airport offers free WiFi, free airport shuttle service, 24/7 reception and gym. Frankfurt's city centre can be reached within 12 minutes by train. 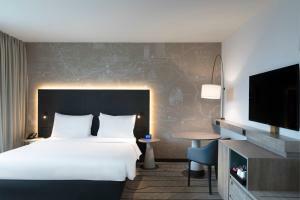 The spacious and modern rooms of Hyatt Place Frankfurt Airport feature signature Hyatt Grand Beds, 42-inch HDTV, refrigerator, a seating area, a refrigerator, and coffee and tea facilities. Other perks include such mulitfunctional docking station, in room safe and a bathroom with either bath or a shower. Optional delicious breakfast is offered each morning which includes hot items, cheese, cold cuts, fresh juices, pastries and more. Guests are also welcome to dine in for lunch and dinner at the casual urban restaurant Zoom Glocal Dining. Perfectly packaged grab and go items such as fresh snacks, sandwiches and salads are also avaialble. 24/7 coffee and cocktail bar offers hot drinks, premium beers, wines and cocktails. Hyatt Place also offers a total of 300 square metres of flexible meeting space.Other facilities include an e-room with printers and computer work stations. Frankfurt Airport is 2 km away. Frankfurt Messe Fairgrounds and Frankfurt's city centre is 7 km away from the property. Please contact the property via telephone or email after booking, if you are travelling with children. This deluxe king room is especially spacious and features Hyatt's signature grand beds, a cozy corner with sofa-sleeper or chaise lounge. 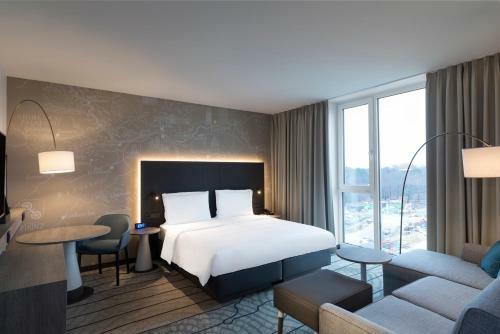 The room also comes with a 42-inch flat screen TV, a work desk and floor to ceiling windows, which can be completely darkened with drapes. This king room features Hyatt's signature grand beds, a cozy corner with chaise lounge. 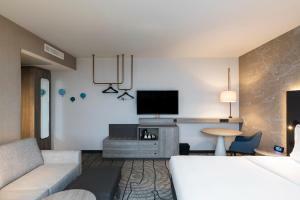 The room also comes with a 42-inch flat screen TV, a work desk and floor to ceiling windows, which can be completely darkened with drapes. 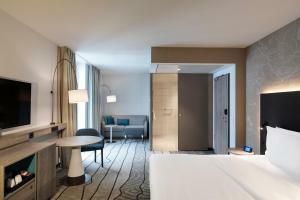 This deluxe twin room is especially spacious and features Hyatt's signature grand beds, a cozy corner with sofa-sleeper or chaise lounge. The room also comes with a 42-inch flat screen TV, a work desk and floor to ceiling windows, which can be completely darkened with drapes. This twin room features Hyatt's signature grand bed, a 42-inch flat screen TV, a work desk and floor to ceiling windows, which can be completely darkened with drapes.